Title: Comics Squad #2: Lunch! 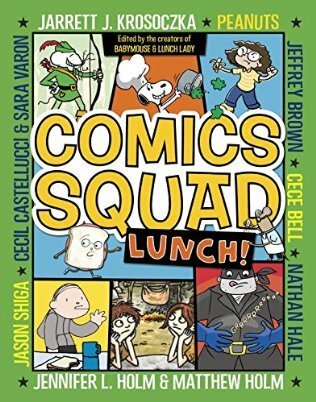 Read Book Comics Squad #2: Lunch! Calling all kidz! Do you like comics? Do you like laughing till milk comes out of your nose?! Look no further—do we have the book for you! All your favorite comic characters are right here in one book, including the Peanuts gang, Babymouse, and Lunch Lady. This all-star tribute to classic Sunday comics includes eight sidesplitting, action-packed stories about every kid’s f Calling all kidz! Do you like comics? Do you like laughing till milk comes out of your nose?! Look no further—do we have the book for you! All your favorite comic characters are right here in one book, including the Peanuts gang, Babymouse, and Lunch Lady. This all-star tribute to classic Sunday comics includes eight sidesplitting, action-packed stories about every kid’s favorite subject—LUNCH! Lunchtime can be fun, wild, yummy, or complete chaos! And in this second collection of comics, it is definitely hilarious.